Twin Peaks’ Jay Aaseng On Inspirado Projecto Radio 11-6-2017 !!! Jay Aaseng from “Twin Peaks: The Return”, stops by KCHUNG 1630am Studios for an interview on Inspirado Projecto Radio! Dori and CEC barrage Jay with stacks of questions about Twin Peaks and his times collaborating with David Lynch! You can watch our Periscope archive of Inspirado Projecto HERE. We play a few songs from the new “Twin Peaks: The Return” soundtracks, talk about how Jay met David Lynch and his short film “Beer Pong Girls”. KaPow Intergalactic Film Festival, which ran November 9-15 at NoHo7 Laemmle in North Hollywood, screened “Beer Pong Girls” during a short film block on November 15th. It was an honour to see his film projected onto the Silver Screen and meet so many extraordinary filmmakers! We look forward to seeing more of his creations at KaPow IFF 2018, in addition to collaborating with him on future Inspirado Projecto episodes! If you’d like to hear the entire Inspirado Projecto audio episode, you can click here to PLAY THE ARCHIVE! This episode is in memory of Nicholas’s Father, who died a few days before this broadcast. Dr. Tom Phillips had two doctorate degrees, and a masters. He was a virologist. Floral arrangement created by Nicholas Phillips. This episode of Inspirado Projecto covers a lot of bases live on the radio in addition to visually on Periscope! Yes, of course synchronicity, precipitation, art, dreams, and music are discussed and presented in their younique audio formats as per usual. Captain Nicholas, everybody’s favourite Station Manager of KCHUNG 1630am, co-hosts another piece of the puzzlementary. We discuss Yachtley Crew’s recent sold out show at The Viper Room, the astounding Adam West tribute at City Hall in Los Angeles (June 15, 2017) where the Batsignal shone brightly, the Office of Night Things’ Dream Phone (call them at 800-390-0934 and leave your recent dreams! ), talk about exciting new Thimbleweed Park point-and-click adventure game updates, spin a Bobbie Deerfield song, educate the populace with another Henry D. Horse “Fun Fact”, present a song by Linney, discover new Hollywood gossip with the Celebrity Medium on The Celebrity Afterlife Report, shine light on another fun sound collage by Boys Nitroglycerin Pep Club (PQ Ribber’s project, which is unfortunately not credited during the episode, yet luckily credited here! ), exhalt the phenomenon known as Twin Peaks and how it is massaging the cosmic consciousness, AND… dig up a wonderful rare-ity by Chris Cornell from the newly released Deluxe Edition of the “Singles” movie soundtrack! Oh yes, we also visit the Dream Phone!!!! And now, some photos taken at the Adam West Tribute…. Dave Uchansky from the movie “Bloody Bobby” and I with the beloved Batsignal! Amazing costumes on this Dynamic Duo! One Batmobile on stage-left of City Hall! Diana Prince XO Horror Blogger and I, soaking in the Batmania! Another Batmobile, stage-right of City Hall! PHENOMENAL job on these authentic costumes! Watch out for the GOON! Oh yes, and if you’d like to listen to the actual audio archive of Inspirado Projecto, you can click HERE!!!! Till next time, keep the Inspirado flooooowwwwwiiiinnnnn! On this very special episode of Inspirado Projecto we are joined in the KCHUNG 1630am Studio with: Christine Moore (actress of “Glenda”, a film about Lucy Moran’s Daughter) and frequent contributor Jeff Finn (Documystery Director of “Strange Septembers” and “Before The End”), to discuss the magic of David Lynch, his projects, sightings of him, Twin Peaks Season 3, and how it all affects the mass consciousness. Before we dive into some of the giblets about the astounding Mundee Pro-gruhm, a very Lynchian moment found us in the morning on US101, whilst Jeff and I were scootin’ along to breakfast. We witnessed the actual World Famous Oscar Meyer Wiener Mobile as a real-life entity! One of my childhood friends used to have the Matchbox Car-sized version, so this was crazy to see it as its true size! This is the EVIDENCE! The Inspirado Projecto gang had the pleasure of broadcasting some of its wavicles LIVE through Periscope, before a happy accident occurred. If you’d like to see a motion picture archive of how the show unfolded, complete with facial expressions and other such nonsensicles of human behaviour, the future awaits you RIGHT HERE! As if the day couldn’t get any Lynchier, after the show, Jeff pulled something amazing from his bag and gave it to me. TWIN PEAKS action figures!?!?!? How phenomenal is that? If you’d like to hear the entire audio archive of Inspirado Projecto’s show “Peakers”, from May 29th and geek out bigtime along with us…you can click ON THIS LINK RIGHT HERE! Thank you Jeff, Christine, David Lynch and the cast/crew/sound of Twin Peaks for the Inspirado! On today’s Inspirado Projecto episode, “Parallax”, on KCHUNG RADIO, we welcomed my fellow Columbia College Chicago Alumn, and Mastermind of RogersOrion Management, Orion Barnes! We reminisced about being Directed in the play “Ivanov” by our Mentor and head of the Columbia Theatre Department , Sheldon Patinkin, (and how Sheldon’s teachings aided us in applying ensemble-based collaboration). We engaged intriguing conversations about: the upcoming May 21st Twin Peaks Season 3 (in conjunction with Orion’s personal story about David Lynch’s encounter with Orion’s Sister’s Woodland Creature), his upcoming projects, outstanding synchronicities, his experiences with being in Steppenwolf Theatre’s production of “Slaughterhouse Five” by Kurt Vonnegut (and then what it was like to meet Vonnegut after a performance one night). We heard a piece of Steve Kirk’s “Thimbleweed Park Soundtrack”, recorded directly from the game. We also have been given 3 COPIES OF “THIMBLEWEED PARK” TO GIVEAWAY. Also, here’s a fun article about Andy Kaufman and his greatest practical joke! We heard some Fun Facts from Henry D. Horse, played a song written by Lawrence August…. ….and sang/played by Jason Karr…. We presented a unique sound collage by Brett E Berman’s and Shaman Q‘s new project “Boy’s Nitroglycerine Pep Club” and displayed the new advert for the upcoming KaPow Intergalactic Film Festival, played an old King Missile classic which most likely inspired Loreena Bobbit, mentioned alternate reality games, talked about cross-over youniverses with parallel stories found with subjects such as Hamlet by Shakespeare! KCHUNG Computer Technical difficulties prevented today’s audio episode, “Parallax” with Orion Barnes on Inspirado Projecto, from archiving. The GREAT NEWS IS we captured the FULL behind-the-scenes all VIDEO version of this show on Periscope. It has been archived HERE. ALSO, lastly but not-to-be-dee-leest-ley…we offered a new “Celebrity Afterlife Report” featuring new juicy news gossip of what Barry/Barris and other dead celebs are doing in the afterlife! Since we weren’t able to hear it, I present the full broadcast to you now. Please like and subscribe to their mystical channel, if your guides compel you! Inspirado Projecto broadcasted through KCHUNG’s Mobile Transmitter 1-29-2017 from FAR Bazaar’s 40th Anniversary, in Room FA55 of the Old Fine Arts Complex, at Cerritos College. Were you there in the room between 1pm-3pm? This episode is co-hosted by CEC, Phil Donlon, Alec Smart, and Sherman Sitter (from “Don’t Feed The Animals”). Josh, Monica, Little Joshua and Gabriella Clendenin showed up to contribute their creativity! Many surprise guests appear, including celebrities: David Bowie and Frosty the Snowman. Songs/spoken word is featured by: Elliott Smith, The Blues Brothers, Gladys Clendenin, David Lynch, Samantha Light, The Monkees, a mashup of Kurt Schwitters & Moondog, Japanese MEAT Clown, Andy Kaufman, Eagleman, Fugazi, PSY-CORP, Henry D. Horse, Gabriella Clendenin, Warren Zevon, The Human System and Tony Clifton! Check out the video archive of the madness, since we simultaneously broadcasted LIVE through Periscope! The Audio was recorded with a ZOOM H4n sitting on a table pointed at the audience, offering many more perspectives than what the at-home-viewers experienced.You can listen to it on Archive.org! This unexpected interview conducted by Casey Rider of A.V. Media, happened outside after the broadcast. Thank you James MacDevitt, Casey, KCHUNG and to everyone who put together such an extraordinary event! UPDATE! 2-4-2017 . . . Micky Dolenz from The Monkees was just tweeted about the fact that his song with Henry Nilsson, “Good Times“, was played twice during our broadcast at FAR Bazaar. He RETWEETED IT! How cool is it, that Inspirado Projecto is now on his radar?!?!?! KCHUNG 1630AM – Friday 13th Episode! KCHUNG 1630AM broadcasting from beautiful Chinatown, Los Angeles, invited me to play in their studio, Friday the 13th. This was the 5th time I’ve done an Inspirado Projecto radio show there, yet the first time I was by myself. Brian D’vil, Jamie-lee Wise, Alec Smart and/or Phil Donlon have been my co-hosts in previous episodes. Having others to bounce ideas off of, with the luxury of setting up the next tracks while someone else is talking, helps in creating a smooth show. It was a fun challenge to juggle songs and talk at the same time. The joy of live broadcasting allows for any number of surprises to enter into the experience. David Lynch refers to these as ‘Happy Accidents‘ and in fact, looks forward to them. Allowing for the possibility of Happy Accidents and making peace with the idea that you’ll be just fine improvising along with them as they happen, gives you the truest sense of knowing you have your own back. It also is an indicator of just how open we are to accepting new experiences and a symbol of how deft we are at creating lemon trees from lemonade. 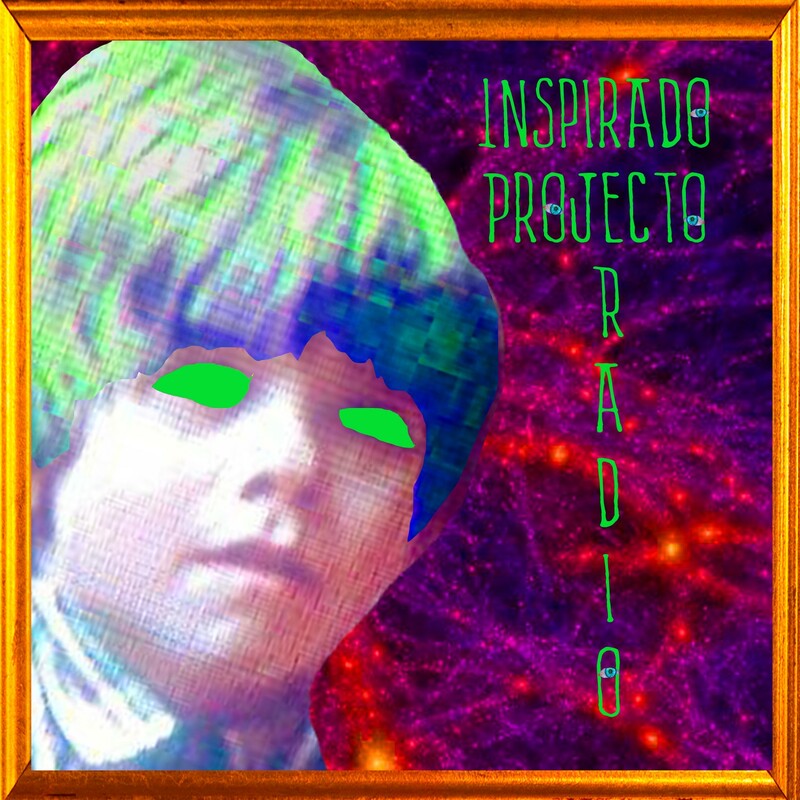 Without furthur soliloquy, I give thee Inspirado Projecto Radio!!! Thank you Jason Karr for this amazing giff!